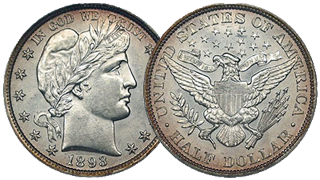 The Barber Half Dollar coin, introduced in 1892 along with the similarly designed dime and quarter, feature the basic design of Liberty on the obverse and an eagle on the reverse. The Barber series was produced until 1915, when it was replaced by the Walking Liberty design. The Barber Half Dollar Coin, traditionally one of the less popular series to collect, has become more popular recently as original pieces are increasingly difficult to find in any grade.